I appreciate the opportunity to testify in support of HB 295, The Maryland Minimum Wage Act of 2014. 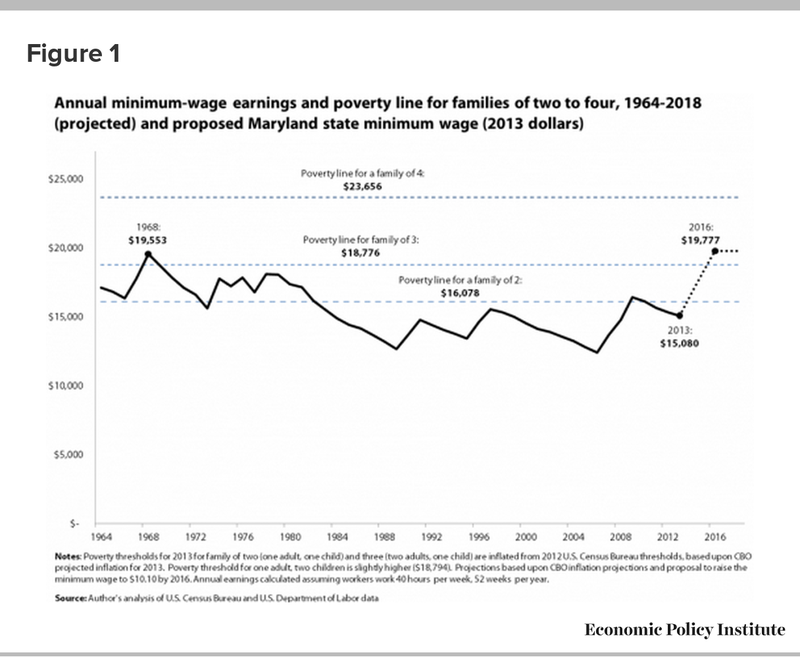 My written testimony provides context for a minimum wage of $10.10, discusses the population likely to be affected, and explains the likely impact on Maryland’s economy. I also want to note the importance of indexing the minimum wage for inflation and raising the minimum wage for tipped workers. The first thing to remember in considering an $10.10 minimum wage is that over the 3-year phase-in period as the minimum is raised, inflation will be eating away at the new minimum’s real value. Based upon the Congressional Budget Office’s projections for inflation over the next 3 years, a minimum wage of $10.10 in 2016 would equal roughly $9.51 in today’s dollars. This would be slightly higher than the value of the federal minimum wage at its high point in 1968, when it equaled roughly $9.40 in today’s dollars. It’s also important to note that over the past 40 years, Maryland’s workers have become far more productive, yet their pay has not kept pace with their ability to generate more from an hour’s worth of work. From 1979 through 2012, output per worker expanded 74 percent for workers in Maryland, yet median real compensation grew only 18 percent. For low-wage workers, it was even worse: over that same time period workers in the bottom fifth of the wage distribution in Maryland saw their wages increase only 3.2 percent. 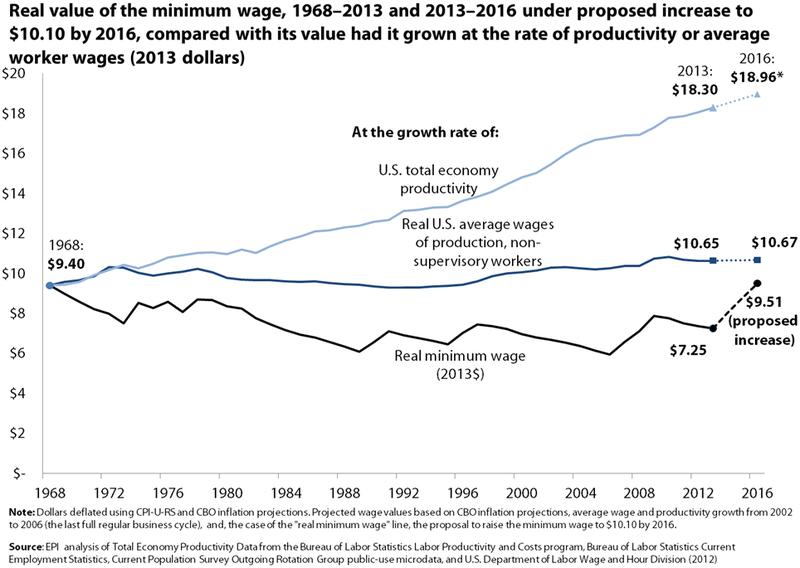 If the minimum wage had grown at the same rate as growth in wages for the average American worker, it would be $10.65 today and about $10.89 by 2016. 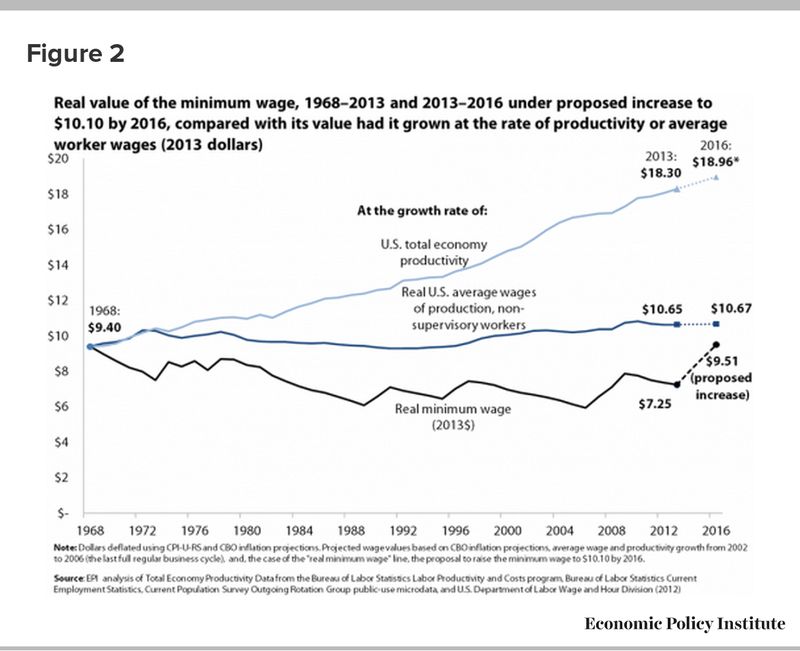 If the minimum wage had grown with productivity since the late 1960s, it would be $19.67 today, and just under $21 per hour under reasonable expectations for productivity growth. This means that our economy has the capacity for a minimum wage far higher than $10.10; we have simply chosen to let its real value erode and have not given the lowest paid workers any of the benefits of improvements in our ability to generate income. Who would be affected by raising the state minimum wage to $10.10 per hour? Raising the state minimum wage to $10.10 per hour in three steps by July 2016 would give a raise to 455,000 Maryland workers. This includes roughly 304,000 workers currently earning wages below $10.10, as well as 151,000 workers earning just above $10.10, who are also likely to receive a raise as employers adjust overall wage ladders. Contrary to common perceptions of low-wage workers, the vast majority are not teenagers. Of 455,000 workers that would be affected by this bill, only 13.3 percent are teens – meaning that nearly 87 percent are age 20 or older. The average age of affected workers is 33 years old. Furthermore, these workers tend to have greater education levels, work longer hours, and carry greater family responsibilities than often thought. Of the workers that would be affected by this bill, roughly half (48.6 percent) have some college experience; more than half (56.0 percent) work full time; nearly a quarter (23.2 percent) have children. There are roughly 210,000 Maryland children with at least one parent that would be affected by this increase. These workers tend to come from families with low to moderate total family incomes. About 55 percent of the affected workers have total family incomes less than $60,000, and on average, these workers earn about 40 percent of their family’s total income. 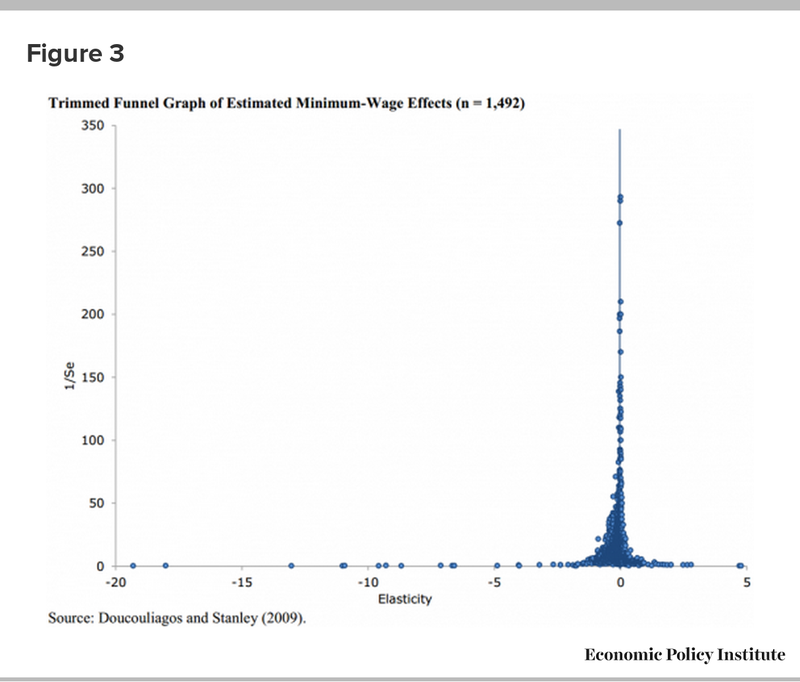 What does the economics literature say about increasing the minimum wage? Does increasing the minimum wage lead to job losses? There is a vast literature on this that spans many decades and has gone through countless methodological improvements, with each new round of literature incorporating lessons learned from the last. First off, the early studies in the 1960s and 70s seemed to confirm the simple supply-and-demand model of competitive labor markets that we all learned in Econ 101, which predicts that an increase in the minimum wage above a “market-clearing rate” will lead to a loss of employment. Up until the early 1990s, there was a pretty strong consensus in the economics profession that increases in the minimum wage caused job loss. But that consensus began to crack with a new round of research in the 1990s, with many new rigorous studies showing no employment losses and in some cases employment gains due to increases in the minimum wage. At the same time new studies that did find negative employment effects were finding them to be much smaller than was earlier thought. By the mid-2000s, the profession was at a place of no consensus on even whether the effect of increases in the minimum wage on employment was positive or negative. However, there was a growing consensus that the effect, whether positive or negative, was small. The figure above shows the results of a “meta-study,” a study of studies, on the bulk of minimum wage research over the past several decades. 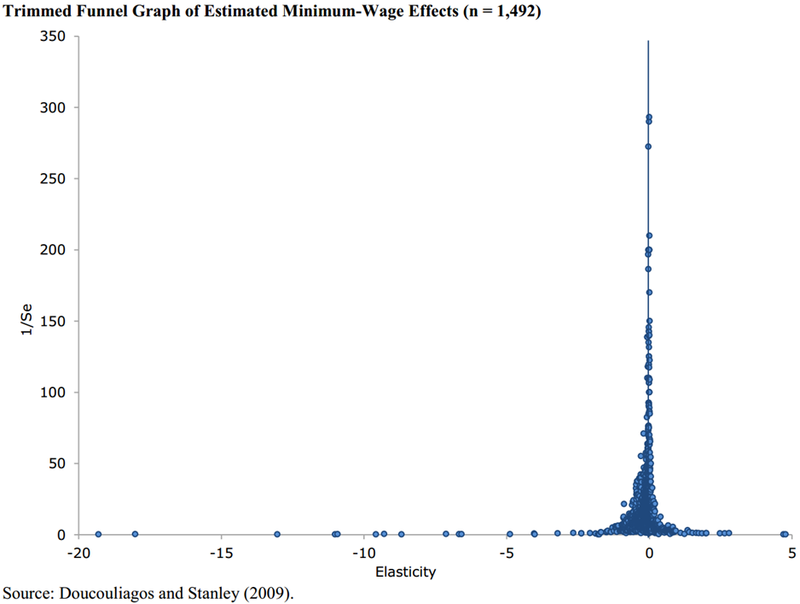 The X-axis shows the effect on employment resulting from a minimum wage increase; the Y-axis shows the statistical rigor of the study. As you can see, the results of the vast majority of studies cluster around zero, and those studies with the highest statistical power—i.e., the most rigorous studies—all fall on the zero line. How will raising the minimum wage affect the area economy? As I mentioned before, increases in the minimum wage have been shown to result in significant increases in earnings for households with low-wage workers. This finding was confirmed by another recent study by economists at the Federal Reserve Bank of Chicago. [iii] They analyzed 23 years of household spending data and found that an increase in the minimum wage causes households with a minimum wage worker to measurably increase their spending over the next year. This is a critical point because it describes how raising the minimum wage can have positive effects on the larger economy. The minimum wage goes primarily to workers in low and moderate-income families who depend on their earnings to get by. These are the families with little choice but to spend every additional dollar they earn. Economists would say that they have a high “propensity to consume out of income”. Thus when you raise the minimum wage, you put more money in the hands of people likely to spend it right away – this provides a boost to the economy. But what about the flip side, the fact that that money is coming from employers? Wouldn’t the employers have spent it if they hadn’t had to pay increased wages — in other words, wouldn’t it have gone into the economy anyway? The answer is yes, but not nearly as much, and that is the crucial point. Minimum wage workers are more likely to immediately spend that money on goods and services in the economy than business owners are. Increasing the minimum wage means you’re shifting money from someone who’s much less likely to otherwise spend it to one that is – the low-wage worker. At the same time, it is not entirely clear that businesses would lose all that income. For example, we know that businesses see some offsetting gains when the minimum wage is raised, particularly from reductions in turnover costs, and improvements in organizational efficiency. Some may also enact small price increases. 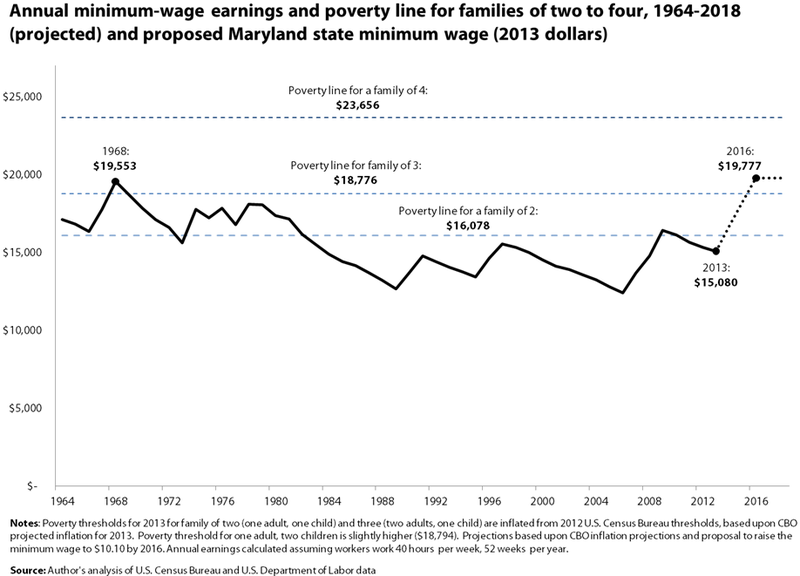 We estimate that increasing the state minimum wage to $10.10 per hour would shift about $721 million to low-wage workers in Maryland. These higher earnings—after accounting for the change in labor costs for businesses and the possibility of small price increases for consumers—translate into a net increase of $456 million in increased economic activity for the state. This is enough additional output to support 1,600 new jobs. As I mentioned at the beginning of my testimony, every year that the minimum wage remains the same in nominal terms, inflation eats away at that wage’s purchasing power. Minimum wage workers have to either cut back on their spending or find ways to supplement their income simply to afford the same level of spending they had the previous year. This threatens the well-being of minimum wage workers, it weakens the consumer demand that drives U.S. GDP, and it strains public budgets as more and more low-wage workers have to turn to public assistance programs in order to supplement their inadequate wages. Indexing prevents this from happening by ensuring that a minimum wage paycheck maintains a constant purchasing power. Moreover, indexing the minimum wage can actually provide greater stability for low-wage employers who can then anticipate their increased year-over-year wage costs and plan to accommodate a small increase, rather than having to question when a minimum wage hike might occur and then absorb a large increase because lawmakers recognize that the minimum has stagnated for too long. Finally, I want to note the importance of raising the tipped minimum wage. Tipped workers in Maryland earn a base wage of only $3.63 per hour. While higher than the federal tipped minimum wage of $2.13 per hour, this low base wage creates considerable hardship for tipped workers. Under the current system, if a tipped worker’s tips for the week plus their base wage of $3.63 per hour do add up to a weekly hourly average wage of $7.25 per hour, the employer is required to pay the difference. However, this is notoriously difficult to enforce. In the current system, a waitress (and roughly 3/4ths of all tipped workers are women) must accurately keep track of her tips and hours every week, calculate her resulting wage, and if it does not equal at least $3.63 per hour, she must go to her employer—the person who decides what shifts she will receive, what sections of the restaurant she will work in, and, most importantly, if she’ll remain employed—and ask for additional pay. Given the inherent imbalance of power between the employer and the employee, this system is ripe for abuse. Indeed, between 2010 and 2012, the Wage and Hour Division of the Department of Labor conducted nearly 9,000 investigations throughout the country in the full service sector of the restaurant industry finding a violation rate of 83.8%. Now, these were not all violations of the tipped provision, nor are these findings necessarily representative of the industry at large, but they do underscore the enforcement problem. We can also observe the differences in economic outcomes this system creates. A 2011 EPI and UC-Berkeley study showed that the poverty rates among tipped workers nationwide are dramatically higher than overall poverty rates of workers – 14.5 percent for tipped workers versus 6.3 percent for workers overall. [v] However, in the seven states with where tipped workers are paid the full minimum wage, the disparity in poverty rates between tipped and non-tipped workers was significantly smaller. [vi] In these states, the poverty rate of tipped workers was 12.1 percent, compared to an overall poverty rate of 6.7 percent. In the 18 states with the lowest tipped minimum wage of $2.13, the overall poverty rate of workers was also 6.7 percent, but for tipped workers, it was 16.1 percent. This correlation between lower tipped minimum wages and higher poverty rates among tipped workers suggests that having significantly different wage floors for tipped versus non-tipped employees results in noticeably different living standards for these two groups. Forcing service workers to rely solely on tips for their wages creates tremendous instability in income flows, making it more difficult to budget or absorb financial shocks. For these reasons we ask the Committee give a FAVORABLE report to House Bill 295. For additional information please contact Douglas Hall at 202-331-5519 or dhall@epi.org. [ii] Production, non-supervisory workers comprise about 80 percent of all U.S. workers. [iii] Aaronson, Daniel, Sumit Agarwal, and Eric French. “The Spending and Debt Response to Minimum Wage Hikes.” (2008). [iv] The 11 states with indexing are: Arizona, Colorado, Florida, Missouri, Montana, Nevada, New Jersey, Ohio, Oregon, Vermont, and Washington. [v] Allegretto, Sylvia and Kai Fillion. “Waiting for Change: The $2.13 Subminimum Wage”. Economic Policy Institute, 2011. [vi] The seven states with no tipped minimum wage are: Alaska, California, Minnesota, Montana, Nevada, Oregon, and Washington.